As Remploy workers take to the streets again and GMB leader Phil Davies asserts the unions’ position, stating that its chairman has betrayed disabled people who work in the factories, the disability movement remains quiet and divided on the issue of the factory closures. This silent division relates to a fundamental guiding principle of disabled people’s liberation, that is achieving inclusion and ending segregation. Disability activists, whose struggle against the oppression of a disabling society is rooted in their everyday experiences of being denied opportunity and told what they can’t do often because ‘it’s too expensive to change’, are fierce in their responses to matters of segregation. And for many activists, including myself, on the face of it, what Remploy represents is segregation, not inclusion. This appears a simple matter then, end segregated employment to achieve inclusion. If only it were that easy. But what of the disabled people who work in the factories? They oppose the closures. They want to keep their jobs, they believe their views have been overlooked, they are protesting and they are right to do so. They stand to lose their jobs in a hostile recession where disability discrimination in mainstream employment is on the rise. For many workers, the Remploy workplace provides a supportive community network, which if lost will no doubt increase their isolation and all the stresses that go with it. Indeed, workers carry out skilled jobs in workspaces where disabled and non disabled people interact in ways not dissimilar to some community Disabled Peoples Organisations (DPOs). Those activists who have engaged with the Remploy workers, are asking what has happened to the rallying cry of the disabled people’s movement, ‘nothing about us without us’? The slogan that essentially commits us to the emancipation of ourselves, by ourselves, alongside one and other, strong, proud and together despite difference, background and preference. So how did we get here, workers disgruntled, disability activists divided, the government seemingly supporting inclusion, and how could it have been different? Well, the Remploy management could have committed to their people and not their profits and handed over the ownership and management to the workers and created disabled people led factories, that were inclusive to the whole community and valued within the market. And the government who gave tax payers monies to the factories could have forced this issue much sooner, indeed by drawing in expertise from disability activists to create perhaps what could have been a model for accessible employment, that promoted flexible and more socially responsible ways of working that would benefit the whole of society. But this unfortunately didn’t happen, the Remploy workers were left to get on with their failing management. On the outside too, some within the disabled people’s movement negotiated a closer position to government in the hope of change. There were some wins too, the DDA, personalisation, and non-means tested benefits, some might say. During the good times, time past quick, as there was no need for a fuss as there was money for the Remploy factories as well as for some disabled people’s organisations to create elite infrastructure if they were to advise on and implement government policy. With so much going on the disability movement seemed to forget about the workers and the issue of segregated employment went quiet. While the unions have been fairly solid in ensuring representation in the work place, the lack of opportunity to collaborate and develop campaigns collectively with disabled people’s organisations proper, has meant a more progressive strategy, where the disabled Remploy workers self determined their liberation and right to work and free choice of employment has been unable to be realised. So where do we go from here? Considering disabled people’s position within society, our lack of mainstream voice and political power, disabled peoples organisations (DPOs) need to come together and reorganise despite our differences in spaces outside of our comfort zones. We need to consider the Remploy issue very carefully, because it gives us insight into how ‘change’ can be easily subverted to suit the agenda of powerful, and how this can be used to distract and divide a movement. As we are starting to realise, the government has stolen the language of the disabled people’s liberation movement, and is now being used against us, to serve their own interests. Theoretically, whilst it could be argued that the closures are right, given the ecomomic crisis, inhumane cuts and the fact that many of the disabled people affected are working class and do not have the same glowing CVs as the reformists in the ivory towers, they are at this time, morally wrong. From this Remploy struggle, we can learn some important things about how to move forward. Disabled people must be ever vigilant of the power of government, for it will easily corrupt and subvert our voice for its own gain. We need collective and independent space to, develop our liberation and to articulate that our lives are to be proud of. We must draw on and develop a language of human rights, that is both aspirational and enforceable. To do this we need to forge further alliances with non government bodies, like Unite’s new community initiative that offer opportunities to organise beyond the workplace, to create a society that values equality, dignity and respect above everything else, as well as new radical groups, such has been done by DPAC and the anti-cuts movement. The Remploy issue wont go away, indeed we must make sure we remember this as a pivitol moment in the history of our movement, when we were reminded again that inclusion begins in our back yards, is often messy and challenging of our established ideals. 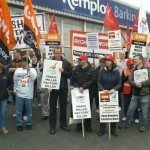 If you disagree with segregation, but support the right of the remploy workers to self determine their emancipation then you can connect with their struggle on the picket lines, in person or in spirit, by way of virtual messages via DPAC website. Remember, power is corrupt but resistance is liberatory and there is nothing about us, without all of us, including Remploy.